If you’ve been patiently waiting for the return of the legendary Ford Ranger, your long wait is over! Ford’s favourite off-road pickup is back and more powerful than ever, thanks to its 2.3L EcoBoost® engine capable of producing 270 horses and 310 lb-ft. of torque. Add in best-in-class max payload and tow ratings for gas-powered pickups, as well as all of the available off-road packaging, and you’ve got a truck capable of taming whatever nature throws your way. 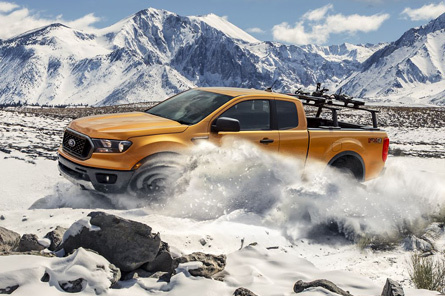 To say that the 2019 Ford Ranger underwent torture testing might be an understatement; Ford engineers were forced to bring in robots to drive the Ranger on some of the most inhospitable roads on the planet. They also hooked the Ranger up to machinery that shook it for days on end, all in an effort to ensure that no off-road adventure would be too much for the Built Ford Tough 2019 Ford Ranger. Freezing cold conditions? Check. Brutally hot weather? You bet. Its been proven over and again—the 2019 Ranger can handle anything. 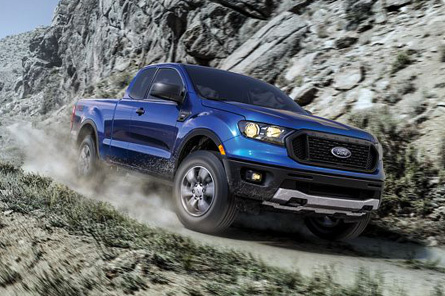 The new 2019 Ford Ranger craves the type of action that can only be found off-road. In addition to the power and efficiency of the 2.3L EcoBoost® engine, the Ranger also comes with standard Electronic-Shift-On-the-Fly (ESOF) technology—allowing you to shift between two and four-wheel drive as quickly as the terrain changes. The available FX4 Off-Road Package with Terrain Management System™ gives you unparalleled control with four selectable drive modes, each with performance calibrated to the terrain. To learn more about the new 2019 Ford Ranger, contact us today at Port Coquitlam’s Metro Motors Ltd.